In a post called An Opportunity For Dalston, I looked at how a double-ended station for Crossrail 2 might connect with both Kingsland and Junction stations. I felt it could bring major advantages to the area of not requiring any demolition, except for the unloved Kingsland station, much better interchange for passengers and improved pedestrians routes in the area. I concluded that all was possible because the Victorians spaced the stations to enable a modern Crossrail station to fit in between. 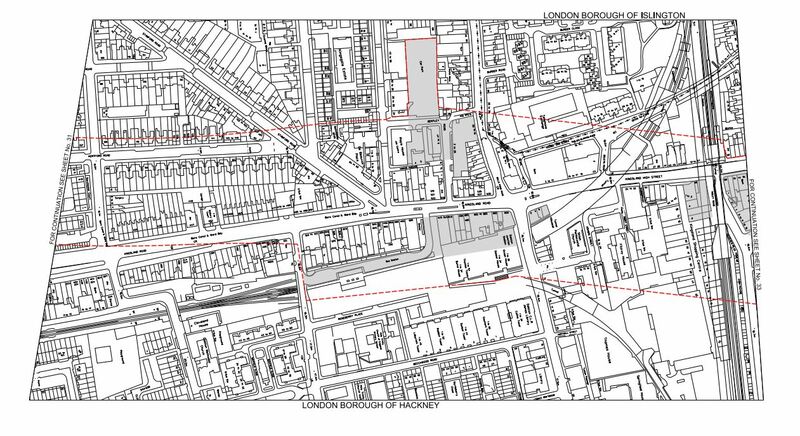 This map from the Crossrail 2 web site, shows the two stations and the safeguarded area. The rail line at the far right or north is the North London Line with High Speed One beneath. The safeguarded area would appear to follow the Kingland High Road, but it does pass close to both stations. I just thought it was logical and never envisaged that those working on the project would entertain a similar idea. But after contacting my MP, I have received a letter from Michele Dix, who is the Managing Director of Crossrail 2. This is a paragraph. We have been working closely with the London borough of Hackney on the early development of the proposals for how Crossrail 2 could ultimately serve Dalston. The work to date has been based around delivering a double-ended station, with one end being at Dalston Junction, and the other at Dalston Kingsland, thereby allowing the Crossrail 2 station to link to both existing stations. As Mr. Miller rightly points out, the distance between the existing stations is well suited to the 250m long platforms that will be required for the Crossrail 2 station, and the greater interchange opportunities to London Overground services also deliver significant benefits. Various factors will also drive the design of the Crossrail 2 station and the related Dalston Kingsland station at Dalston. 1. Crossrail 2 will have to get past and probably under High Speed One and the Dalston Curve, that takes the East London Line to Canonbury and Highbury and Islington. So it will be a deep line, where any stations will need escalators and/or lifts. These stations will also probably be built from the tunnel up, as parts of Whitechapel station are being built for Crossrail. 2. Could Dalston Kingsland station be designed as a station with entrances on both sides of Kingsland High Street, perhaps with a single island platform served by escalators and lifts? 3. Demolition of any quality buildings will stir up a lot of opposition. 4. There isn’t many places to put a work site, with the possible exception of the Car Park in Bentley Road which is in the safeguarded area. 5.Surely the Ridley Road market could be improved by good design of the new stations. I think there is a chance for a good architect with a bit of vision to create an innovative world class station. Perhaps, we need our own versions of these distinctive fosteritos to access the Crossrail 2 station from the surface. These were designed by Sir Norman Foster for the Bilbao Metro. Hence the name! Why shouldn’t us plebs in Dalston have the best?